Does your bow grip work? For most of us, the bow is troublesome. The mechanics of grip and arm movement seem to have endless possibilities to vex us, and tension is a serious obstacle. So I say January is going to be Bow Month here on SRCB. Send me pictures of your bow grip, and tell me whether it works or not. If it needs work, we’ll check it out. If you made a change for the better, tell me how, and I’ll post it and share it, or if you want to post it on your own blog, I’ll link to it. And if you’re wondering, my bow grip works. But it took a long time for it to be reliable, relaxed and effective. I think it was a year after I had graduated from college that the thing settled in…basically, when I started teaching full-time. The change I made had as much to do with my arm as my hand, and the end result is a highly rotated hand and an absolutely flat wrist. 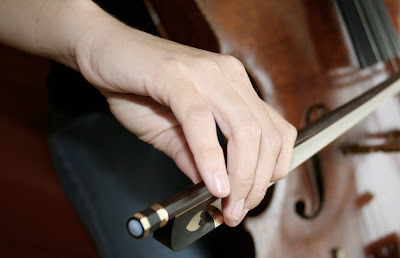 My grip is such that my pinky doesn’t really touch the bow very much, unless I am on the C string at the frog. My thumb is curved and the thumbnail is parallel to the floor, which is another function of the rotation. I also have a rule that the elbow should always be slightly higher than the wrist. So, does your bow grip work? Vlog: flying with the cello and surgery Q & A! Hi, Emily. I’m playing, see blog post today. An excellent opportunity to document where things are now for comparison later. I hope to have mine sent in a couple of days. Thanks for posting this! I have two main problems with my bow grip. I’ve made many adjustments throughout the years and the problems go away and then pop up again later on so it definitely has not settled down. 1) Sore thumb – Usually, I get a sore thumb if I haven’t practiced in over a week. The first few days I get back on the cello…boom – sore thumb. Also, I’ve noticed that if I properly warm up my bow arm and hand, the less likely I will get a sore thumb. Probably has something to do with flexibility. I see that there is a new post on sore thumb so I will check that out. 2) Sore pinky joint. This one I struggle with quite a bit. I know that I seem to tense up my pinky finger so that it is almost straight. I’ve made a lot of adjustments to relax it – this works ok in scales, but when I start going through passages, my pinky finger will tend to straighten out and stiffen up my hand. Any suggestions? is that related to problem #1? nice blog you have going. Every beginner I’ve ever enountered does indeed have a bow ‘grip.’ (myself included when I started out) I’ve modified that term to bow ‘hold’; anything that helps to release the tension..
Or howzabout “bow hang?” My understanding is that it’s not even a hold, it’s incomplete. Only if the string is there helping is it held. Take it off the string, ok, ya gotta hold it, but otherwise, shouldn’t we make the string do its share in holding the bow. Now, if only it were that easy with getting children to help.